Even with the grandstands not extending all the way to the end zones, I'll bet the NIMBY's had a fit when it was built back then, too! I'm still looking for full color pictures of Tulane Stadium in it's last seasons. do we have a date on this photo? or can we work down to a range? 1926-1936? green4life wrote: do we have a date on this photo? or can we work down to a range? 1926-1936? The same was true in 1925, when groundwork was laid for what would become the most iconic of the three Tulane football stadiums — the one that eventually hosted college bowl games and NFL contests. In June 1925, university officials estimated that a stadium large and sturdy enough for the swelling football crowds would cost $250,000 (nearly $3.3 million in today's dollars). They anticipated that the Green Wave's undefeated 1925 season would heighten local interest. The university was unable to come up with the money, so New Orleans residents, media and social organizations launched an effort to generate the funds. It seemed the entire Crescent City was behind the push to raise $300,000 for what was hoped to be a 42,000-seat stadium. Local boosters generated nearly $44,000 in pledges the first day. On Dec. 7, 1925, fundraising organizer J. Blanc Monroe announced the $300,000 had been raised. The stadium opened Oct. 23, 1926. The day was declared a holiday in the city, and a parade marched past City Hall. The day also saw Auburn defeat Tulane 2-0. Bounded by Willow and Calhoun streets, Audubon Boulevard and South Claiborne Avenue, the new facility seated 35,000 fans. Last edited by tpstulane on Thu May 30, 2013 7:37 am, edited 1 time in total. Filled in here with endzones and upper decks. The more I see those images, the more ridiculous it looks. I mean, an 80,000-seat stadium in your backyard. Crazy! But I did grab a brick during demolition, the facade was still up when I arrived freshman year. MicMan wrote: The more I see those images, the more ridiculous it looks. I mean, an 80,000-seat stadium in your backyard. Crazy! I have one as well. Also have a wooden seat they sold at the end. That stadium was there before those houses were there. Came across this photo from one of my customers the other day and I thought I'd share. Aerial photo taken in 1927, by photographer Charles L. Franck. Photo is in the Historic New Orleans Collection. At the very top center you can see the newly built Tulane Stadium. In the center is the field where Tulane played prior to building the stadium. The concrete stands in the left corner of the field were still there when I was in school in the 1970's. In front of that is Loyola's football stadium. Prior to us building Tulane Stadium, looks like their stadium was bigger than ours. Another thing to note is that where Fogelman Arena is now, there were open air basketball courts, which I never knew before. I've also posted the link to the HNOC site so you can see the image larger. RobertM320 wrote: Came across this photo from one of my customers the other day and I thought I'd share. 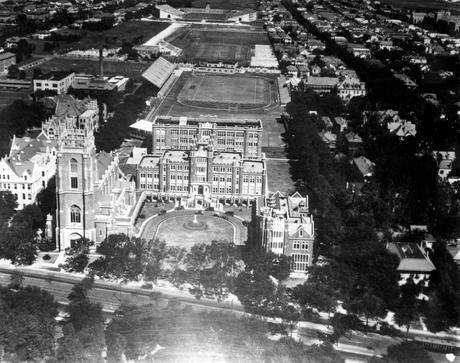 Aerial photo taken in 1927, by photographer Charles L. Franck. Photo is in the Historic New Orleans Collection. At the very top center you can see the newly built Tulane Stadium. In the center is the field where Tulane played prior to building the stadium. The concrete stands in the left corner of the field were still there when I was in school in the 1970's. In front of that is Loyola's football stadium. Prior to us building Tulane Stadium, looks like their stadium was bigger than ours. Great find! I've never seen this angle before. As a kid I remember going with my dad to Buc's, Wolfpack and Green Wave basketball games he would always park on the site of the original stadium. They put rocks down and made it a parking lot but left the original walls up as you said. I remember well my dad telling me that was where the first stadium was constructed. Thanks for bringing back that great memory. If you remember the old ROTC building the 1st stadium was right behind that off of Freret St.
Isnt the Riley center on the site of the North end zone stands ? golfnut69 wrote: Isnt the Riley center on the site of the North end zone stands ? 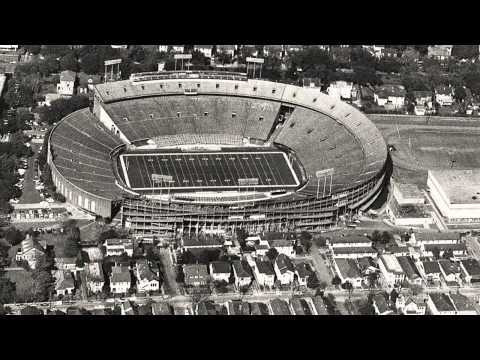 That would be Sugar Bowl Tulane stadium which was the one built between Willow and Claiborne. The 1st (original) that's pictured in the middle was located between Freret and Willow. Right on the site of AB Freeman Business School today. It looks like the ground where Loyola's stadium was eventually became Loyola Fieldhouse, and now their parking lot. Seems strange to see no quad or UC, and no Newcomb. 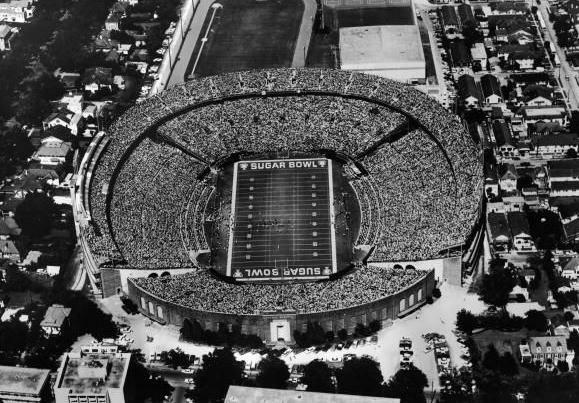 That would be Sugar Bowl Tulane stadium which was the one was built between Willow and Claiborne. The 1st (original) that's pictured in the middle was located between Freret and Willow. Right on the site of AB Freeman Business School today. When I was at Tulane, the remnants of the first stadium were seen opposite the dorm named Monroe. I believe it housed the ROTC facility and the theater used for Theater Arts classes. This was in the early 80's (I'm class of '85). RobertM320 wrote: It looks like the ground where Loyola's stadium was eventually became Loyola Fieldhouse, and now their parking lot. Seems strange to see no quad or UC, and no Newcomb. That's true. I'm class of '80, and I know the set of stands was still there. I remember going over there to look at it a couple of times and trying to imagine some of the early Tulane greats playing on that field. I remember when Loyola dropped Basketball and Tulane made an offer to buy "Loyola Fieldhouse"
So at one time there were three football stadium right next to each other? Wow. Thanks so much for sharing that. Three football fields in a row. What a football town. And this was around 1927, so its no wonder football is in our blood. These photos are amazing. It looks so foreign with no Fogelman, LBC, Freeman, or TLS. With 3 football fields, I doubt anyone was in the NIMBY crowd (even though the fields came before most houses)... Oh how the times have changed. Look at the upper deck on the left hand side of Loyola's stadium. That's exactly what I'd project to see built above the west side stands. If it's steep enough, and has the same footprint as the press box, it would only have to be about 10-15 feet higher than the current structure on the west side. It would put most of the existing seats on that side in its shadow as well. EFF the NIMBY's, let's add 10k seats with an upper deck on the west side. Tell them to make money selling parking in their yards, like the old days. I love the small details you can see when you zoom in. Freret street passes right between the two stadiums. On Loyola's side by Freret, it looks like that small building could be a locker room of sorts for the teams. The building that the scoreboard and clock is on. Also, you can see the entrance gates to Loyola's field from Freret street. As for Tulane, maybe those structures on the east side of the stadium? Sort of looks like an open air covering as a place to get out of the heat and/or rain during halftime. And if anyone's into cars, take a close look at Loyola's horseshoe. DfromCT wrote: Look at the upper deck on the left hand side of Loyola's stadium. That's exactly what I'd project to see built above the west side stands. If it's steep enough, and has the same footprint as the press box, it would only have to be about 10-15 feet higher than the current structure on the west side. It would put most of the existing seats on that side in its shadow as well. Realistically that addition will likely max out at 5,000 seats. The rest of the stadium from student section to family section has 16,326.